When I wrote about Pulino’s, i wrote that it “[wasn’t] a game-changer in the NYC pizza scene.” Having eaten at Donatella, I’m confident that this new pizzeria is the game changer I was hoping for. After I saw the rave that Slice wrote about Donatella, I made plans with my friends Jess and Garrett (of We Heart NY) to try it for myself. Donatella has a lot going for it — they constructed a glowing gold pizza oven, and they brought in a master pizzaiolo from Italy to give lessons to the staff on how to make authentic pies. More importantly to the business, in Donatella Arpaia they have a restaurateur who isn’t afraid of self-promotion. So what sets Donatella apart? It’s the crust — far thinner than most of my favorite Neapolitan pizza places, but still chewy and wonderfully charred. I don’t know how such a thin crust can maintain its structure so well. The margherita that I got was wonderful for its balance of crust, sauce, and cheese, and that balance is what makes for great pizza. I think the balance of ingredients was a little off on the carita, the pizza that Jess ordered. She said she felt a little silly complaining that a pizza topped with anchovies and olives was salty, but in a restaurant setting I think we leave it up to the chefs to find that balance for us, and that it’s a legitimate gripe. Still, there’s no arguing with that fantastic crust and that perfect char. 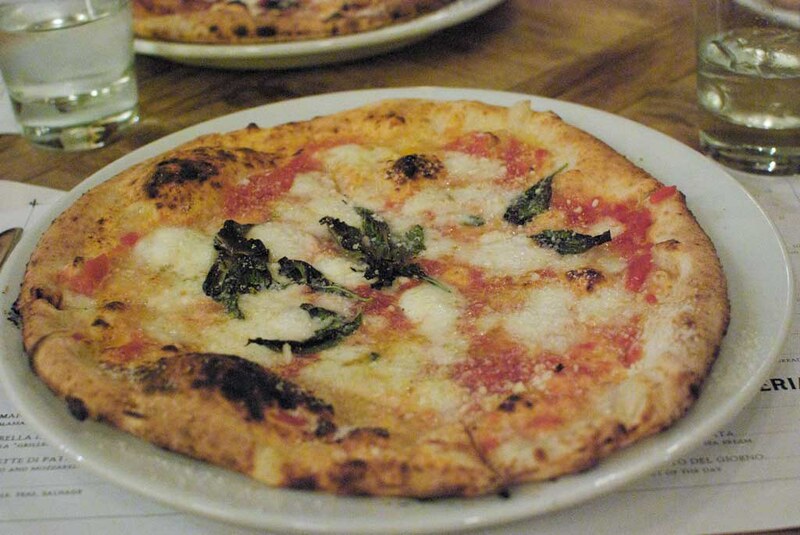 Donatella may just be serving the best Neapolitan pizza in Manhattan.